Tom Glynn-Carney (born 7 February 1995) is an English actor. He is best known for his supporting role in Christopher Nolan's war film Dunkirk (2017). 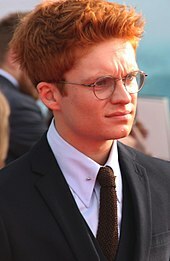 Glynn-Carney studied at Canon Slade School in Bolton, and went on to study Musical Theatre in Pendleton College of Performing Arts. He then attended the Guildhall School of Music and Drama where he studied acting. While studying, he participated in professional stage adaptations of Peter Pan and Macbeth. From April 2017, Glynn-Carney starred as Shane Corcoran in the Jez Butterworth play The Ferryman which opened at the Royal Court Theatre. He later transferred with the production to the west end at the Gielgud Theatre, leaving the production in October 2017. Glynn-Carney won the Emerging Talent Award at the Evening Standard Theatre Awards for his performance. Glynn-Carney's first film is war drama Dunkirk, which was directed by Christopher Nolan and released in July 2017. He plays Peter, the son of the captain of a civil boat that sailed to rescue British soldiers from the surrounded city Dunkirk. ^ Hoggard, Liz (30 July 2017). "Tom Glynn-Carney: 'Dunkirk is about courage and community, not war'". The Guardian. Retrieved 10 October 2017. ^ Chauffeur dhari, Saiqa (30 September 2017). "Dunkirk actor Tom Glynn-Carney, who went to Canon Slade, stars in new BBC drama The Last Post". The Bolton News. Retrieved 10 October 2017. ^ "Who is Tom Glynn-Carney? The Salford student who swapped the hallways of Pendleton Sixth Form College, for a career on the big-screen". Salford City College. 4 June 2018. ^ "Acting alumnus Tom Glynn-Carney wins Evening Standard Emerging Talent Award 2018". Guildhall School of Music & Drama. 4 December 2017. ^ "14 top talents to watch out for in 2017 – as chosen by current TV stars". Radio Times. 1 April 2017.